The most important accessory to your kilt…the Sporran! 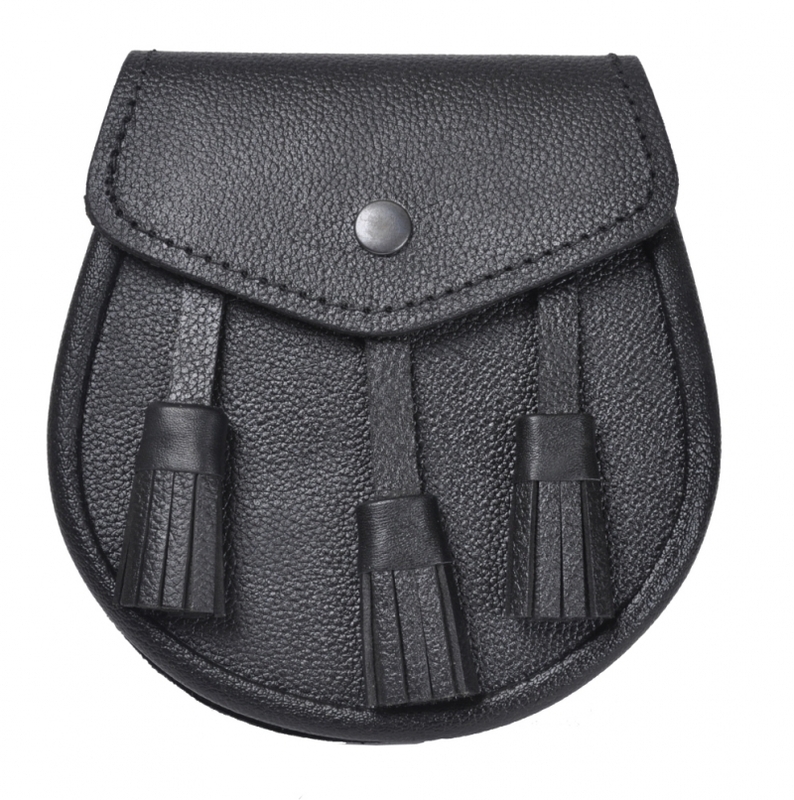 The Black Leather Sporran has the look of traditional day sporrans, and is very functional. This is our basic entry-level sporran made from 2nd-grade leather. 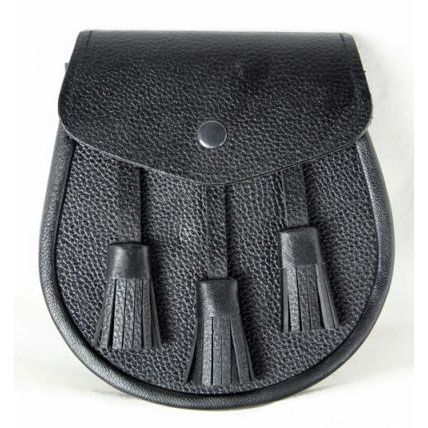 Designed to hold your wallet, keys, phone and other valuables. Just bought 2 Sport Kilts from a friend who “out grew” them. (weight issues) I plan to wear them on a cruise leaving on St. Patrick’s Day. Bought this sporran as a daily wearer to go with the theme of the kilts. I’m very pleased with the quality and the speed at which it got to Pennsylvania from California. My passport wallet fits in it perfectly. Can’t wait to party aboard ship! This is the fourth of these sporrans I have purchased from Sports Kilt. Two for me and these most for my two sons. There are dressier sporrans, but I’ll pass. These do what they need to do and look clean and classical. Well done, you! This is what I expected for the price. Delivered as promised. Sizes do run small. I wear my Kilt every week while golfing.I get a lot of compliments. Love it and very functional!! I bought it because the kilt just doesn’t have enough pockets for me. The sporran has a lot of room and I was very surprised about that. Was easy to hook up and sit at the right height. I purchased this to wear with a traditional kilt (I do Scottish Country Dancing), and it did the job perfectly. It’s not flashy, but it is a great basic daywear sporran. My only complaint with it was that it was WAY too big for me, and I had to drill a new hole in the belt at almost the end of the strap in order for it to stay on. This made the strap look very bad, but fortunately, I am wearing this with a belt (and most daywear sporrans are worn with belts). Without a belt, though, this may not be the right sporran, or you may have to cut off some of the leather of the belt. The sporrans are of great quality.The workmanship is A1.You can’t go wrong with one of these sporrans. The leather day sporran is quite roomy. I can fit my wallet, my cell phone, and my keys into it without a problem. It was stiff at first, but I added some mink oil to it to soften it up. This acessory just adds to the coolness factor of my kilt! Plus, it’s a good place to stash a cell phone. Made the outfit mobile. My son was able to carry key, phone, ID and money. Also helped to hold down Kilt and made him feel more stable going without underwear! i purchased this sporran as a gift for my brother to go with his first kilt. really appreciated the excellent information provided on the site about the different types of sporrans, and all of the other kilt accessories. it’s all new to me! we were happy with the sporran we chose–it’s well constructed and very handsome. it shipped promptly. looking forward to shopping here again! thank you, thank you. It has enough room for a wallet, keys, cell phone and money clip. Nothing bad to say, I love it. It holds more than I expected, and thats nice. Also, It doesnt wander, it stayes exactly where you put it. I am totally satisfied with this sporran. If you are looking for a good basic sporran that will serve your needs without making your wallet weep like a baby, this is the one. Very nice sporran, looks very clean and strong without being excessive or gaudy. Had to rate it a 4 because the snap is quite stiff and difficult to close, but I’m hoping it will soften up over time. Very handsome and worth every penny….. Very durable and light, easy to put on and wear. definitely recommend. I liked the product, the only problem with it I have is that it was not big enough to fit me. I had to modify it with an old belt of mine to make it fit. Good product for the money, transaction was quick and responsive. This is a very serviceable sporran, with ample room for the necessities. The leather on the tassels and the belt-part of the chain was very stiff at first, but they have become more flexible through working them in. Good value for price point. SportKilt describes it right in their overview of the product basic and functional. Great for first purchase. Got one of these and love it. I highly recommend getting one of these with your kilt purchase so you can carry stuff around! My only concern is the band that threads through the back feels a little flimsy and it won’t be long till, I’m afraid, it will break.